This page has every feature for helping you create that perfect resume in the fitness instructor job profile. These will be used as suggestions as to what your own completed resume should look like when they are completely finished by you. Our suggested place to put your resume file is the desktop..
3 sports fitness resume formats are free above. 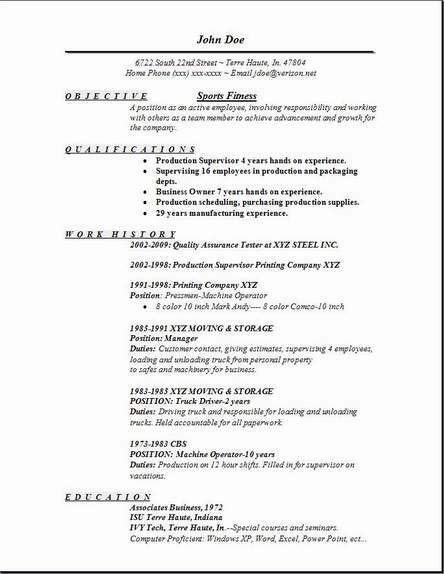 Use your job history and also contact information. Backspacing the provided text is a simple efficient way for you to complete the editing process. Next, look at all 3 formats when you are done. Then you can decide what looks best for you. It's super fast and simple. You might get done with this easy format in 35 minutes or more, that's it. It helps to have your drafted resume notes in front of you, while beginning to edit the sports fitness resume example. Don't stop until you are reasonably satisfied with your results. 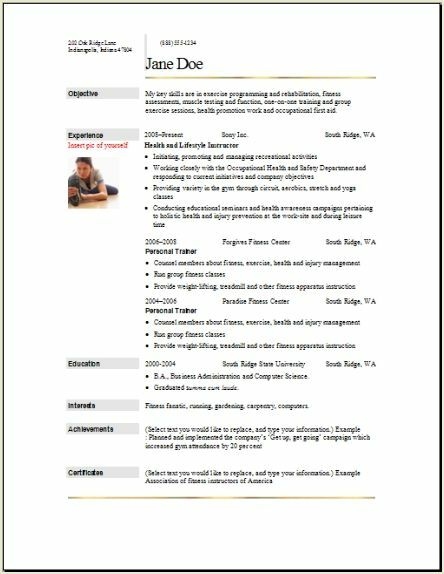 You can as a suggestion add something from the other pages you like to this particular resume to change the look and feel of it if you wish. Fitness workers will lead, provide instruction, and try to motivate all individuals or also large groups in their exercising activities, including exercise to improve cardiovascular health, strength or weight training, and also stretching exercises. They will work in a variety of places including health clubs, some country clubs, also area hospitals, local universities, resorts, and will even give private instruction at clients’ homes. Fitness workers will also have classes at a public workplace, where they will organize fitness programs that are made for all employees of any age group. Will work on a one person basis with their clients, this could be at a gym or at their client’s home. They assess their clients’ fitness level and set fitness goals for the individual. Trainers also monitor their clients’ progress toward their physical fitness goal. They also make recommendations on how to modify their clients’ lifestyle to improve their fitness. Will also conduct group sessions that include aerobic exercise, lots of stretching exercises, and muscle and toning techniques. Cardiovascular classes are usually set to music. Group instructors will set up their program to ensure that their own classes stay motivating, are safe, but also challenging, yet they will not be overly difficult for group participants.